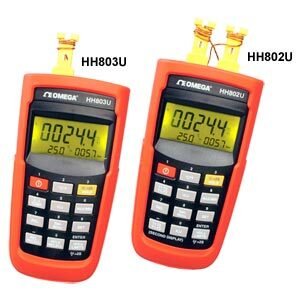 The HH802U is a high accuracy J/K input thermocouple thermometer with two 5 digit displays for temperature and a third display for elapsed time. This model also features a built in USB port for use with the optional Windows data logging software and cable, as well as a DC power socket for extended use with the optional AC adapter. The HH802WE model replaces the USB port with a built in wireless interface for cable free data transmission to a PC when purchased with the optional wireless receiver and Windows software. The HH802U also includes a REL recall, Hi/Lo limit recall and cold junction adjustment feature. Dual Input, J and K thermocouple, Wireless Data Transmitter. Note: Wireless models operate in the 868.1 to 868.5 MHz frequency band, for use in Europe only. Comes with 4 “AAA” batteries, Type K thermocouple (one per channel), rubber boot and complete operator’s manual.